A police officer on duty at a passenger transit checkpoint of the Hosea Kutako International Airport was caught red handed while stealing cash from the bag of a passenger on her way to board an aircraft. 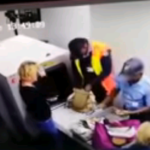 Closed Circuit Television Cameras caught the entire crime on video and the footage shows a yet unidentified Warrant Officer rifling through the hand bag of the passenger and then handing it over to his colleague who the takes the money from the baggage while looking the passenger straight in the eye. While his colleague removes the money from the bag the Warrant Officer can be seen distracting the passenger by asking her for documents. The passenger discovers the theft and confronts the senior police officer who empties his pockets to show that he has nothing on his person to connect him to the theft. The officer who stole the money goes on with his ‘task’ as if nothing happened. The incident occurred on Tuesday and the police officer caught stealing from visitors to Namibia was arrested. Khomas Regional Commander, Commissioner Sylvanus Nghishidimbwa, confirmed the arrest of only the junior police officer.